There are several types of link options available to the designer. The purpose of this section is simply to summarise the basic characteristics and principal design considerations of each option. It is important this section is read in conjunction with the other advice offered in this manual. The appropriate link option will be primarily guided by the advice on Segregation and Integration. 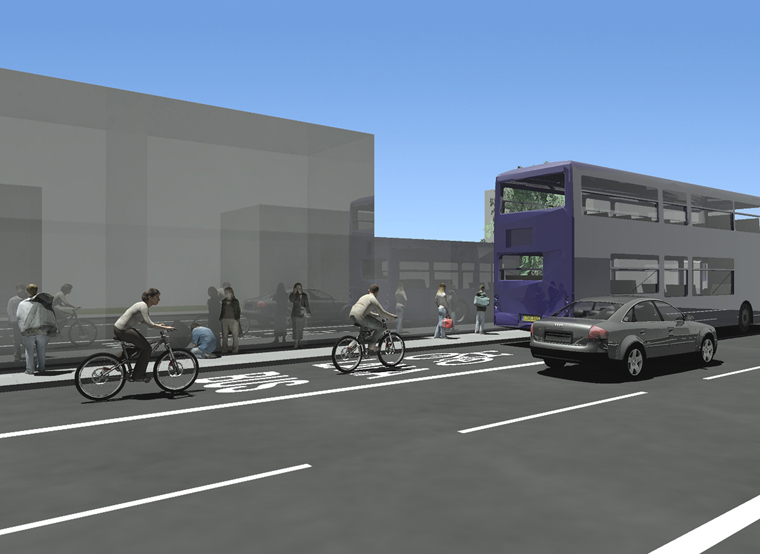 In most cases, regardless of the choice of link option, the cyclist will be brought through junctions integrated with the traffic using transitions if required. 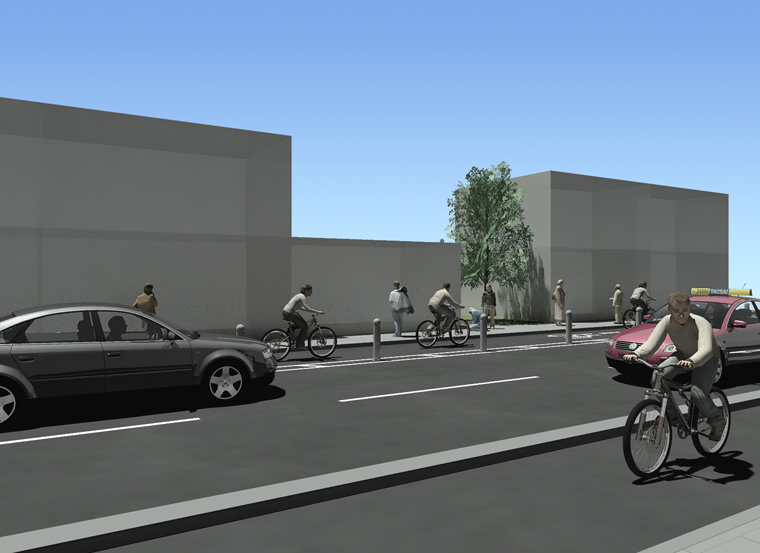 The reason for this is that the alternative gives rise to significant cycling-pedestrian conflicts which are currently inappropriate to Irish urban town centres. 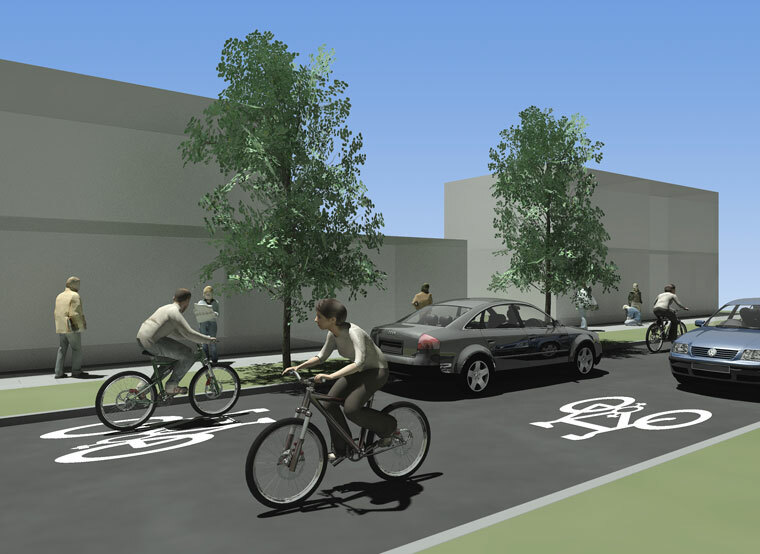 Mixed or shared streets are suitable in low traffic single lane environments where cyclists and pedestrians take precedence over vehicular traffic. 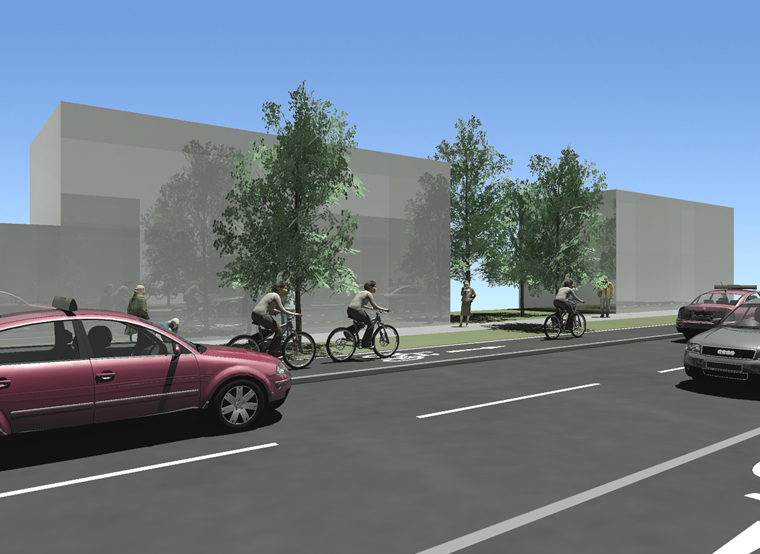 The key feature from a cycling perspective is that cyclists “take the lane” in line with vehicles. 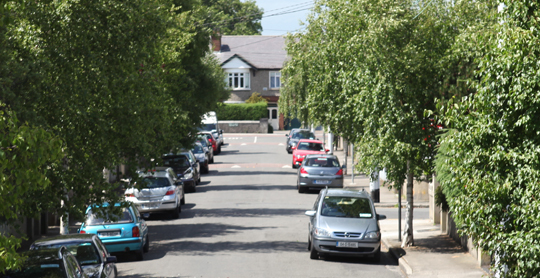 Where such streets are less than 5.5m in width, there should be no central lane marking, thereby ensuring all road users in either direction yield to each other. 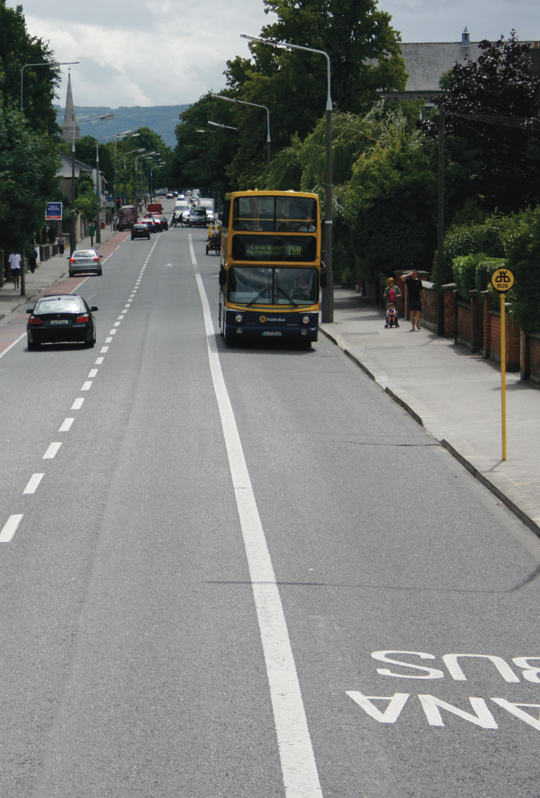 For widths between 5.5 and 7.0m, a central lane marking should be provided to separate opposing traffic. 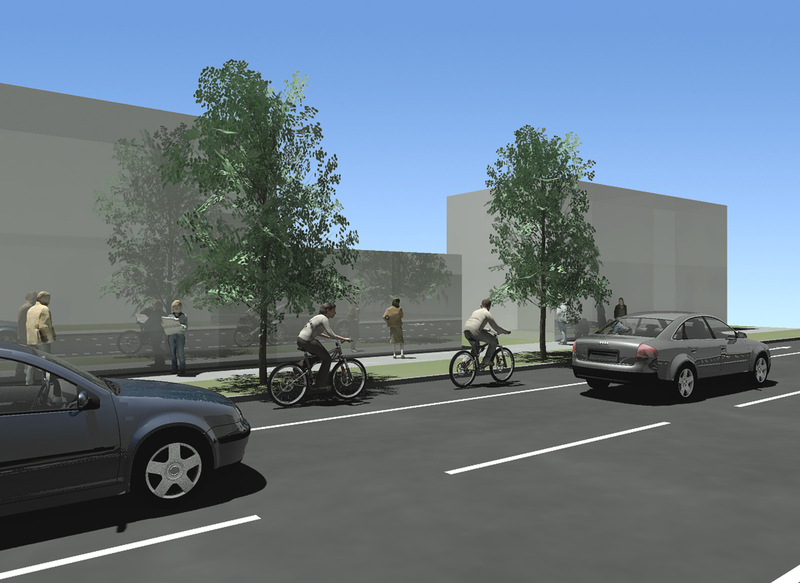 Residential areas, access roads and streets, environmental traffic cells and shopping streets. Not appropriate for multi-lane roads. 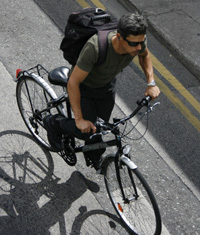 Cycle lanes are lanes on the carriageway that are reserved either exclusively or primarily for the passage of cyclists. They are normally located on the left or kerb side of the road and benefit from being included within the normal road maintenance programme. 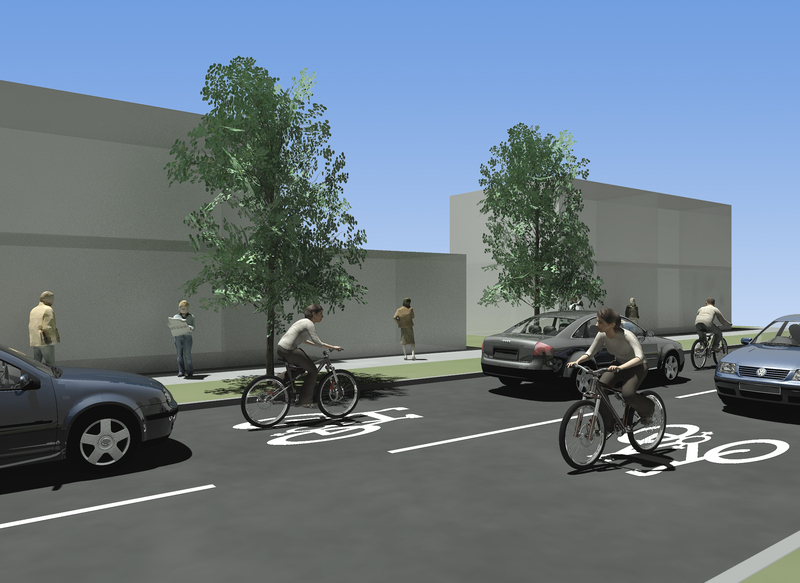 they are only effective when unhindered by parking and loading activity. Carefulattention to this design issue is required especially in town centres and around schools. 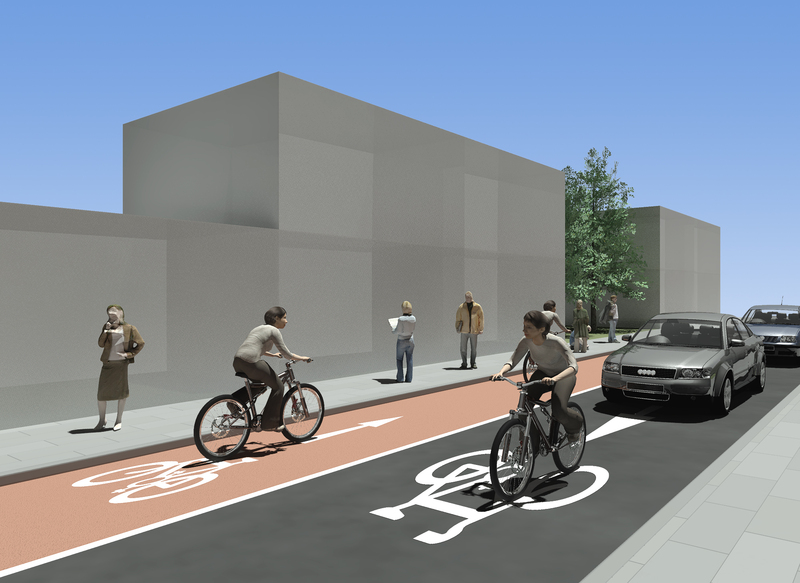 Standard cycle lanes include Mandatory Cycle Lanes, Advisory Cycle Lanes and Raised Cycle Lanes. 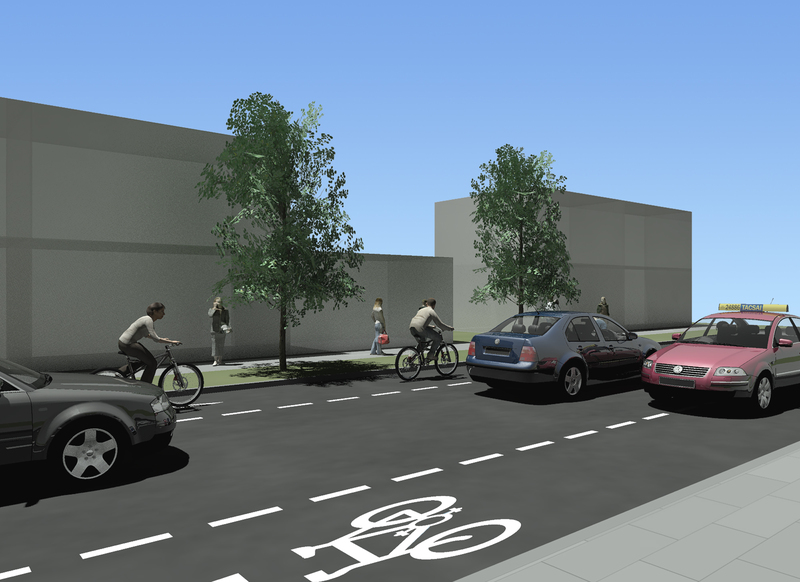 In this manual, if cycle lanes are to be provided, the preferred option is the Mandatory Cycle Lane wherever possible. 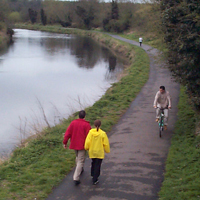 Mandatory Cycle Lanes are marked by a continuous white line which prohibits motorised traffic from entering the lane, except for access. Parking is not permitted on mandatory cycle lanes. 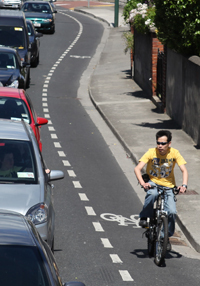 Mandatory Cycle Lanes are 24 hour unless time plated in which case they are no longer cycle lanes. 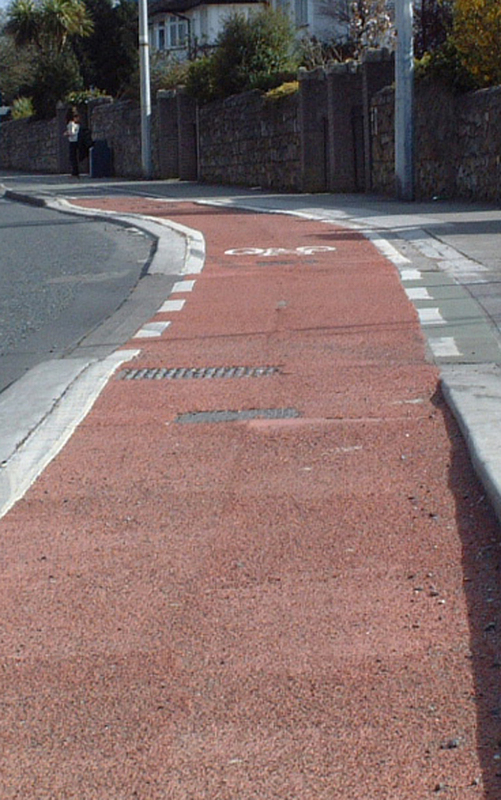 Advisory Cycle Lanes are marked by a broken white line which allows motorised traffic to enter or cross the lane. 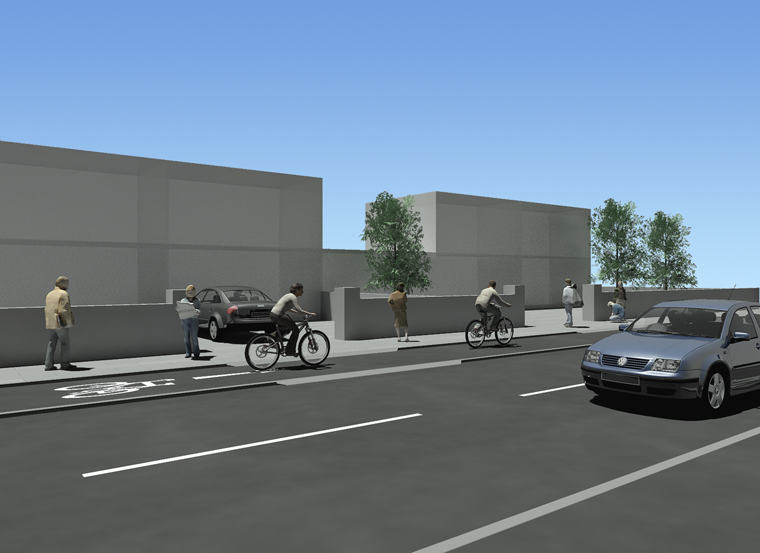 They are used where a Mandatory Cycle Lane leaves insufficient residual road space for traffic, and at junctions where traffic needs to turn across the cycle lane. Parking is not permitted on advisory cycle lanes other than for set down and loading. Advisory cycle lanes are 24 hour unless time plated. 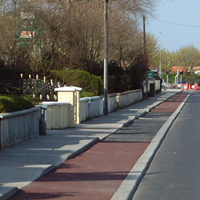 Along collector roads with frequent entrances and driveways where in a shelf arrangement the cyclist is slightly lower than the footpath and slightly higher than road. 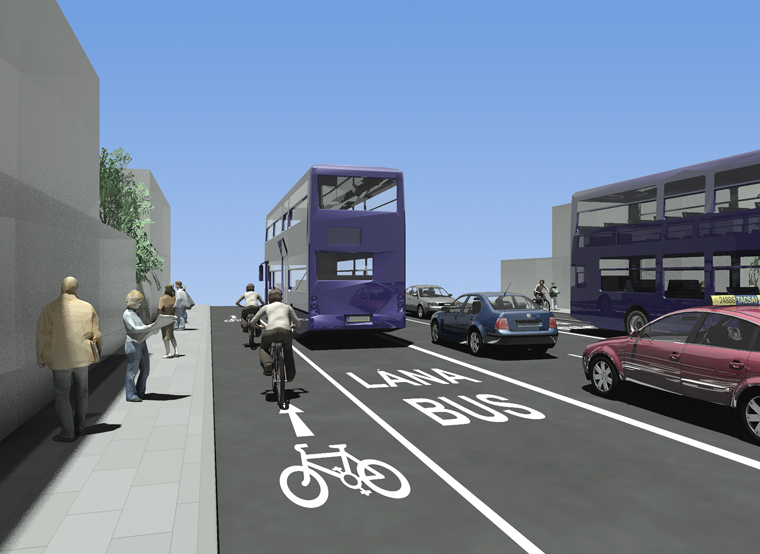 Some bus lanes are extremely busy traffic terms and the designer should consult the Guidance Graph before presuming on the suitability or otherwise of cycling in the bus lane. Careful consideration is required when bus lanes are time plated, as the traffic regime outside of bus operation may be less cycle friendly. Guidance on bus stops is provided elsewhere in this manual. 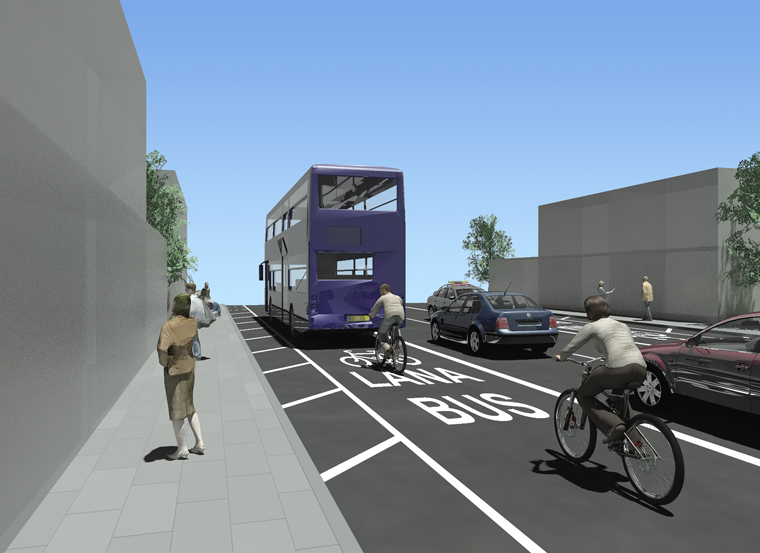 For overall policy on cycling and buses, consult Principles Underpinning Development of the Quality Bus Network and Cycling, October 2009, Department of Transport. Existing bus lane is wider than 3.0m, but less than 4.5m wide and consequently not wide enough for a parallel cycle lane. 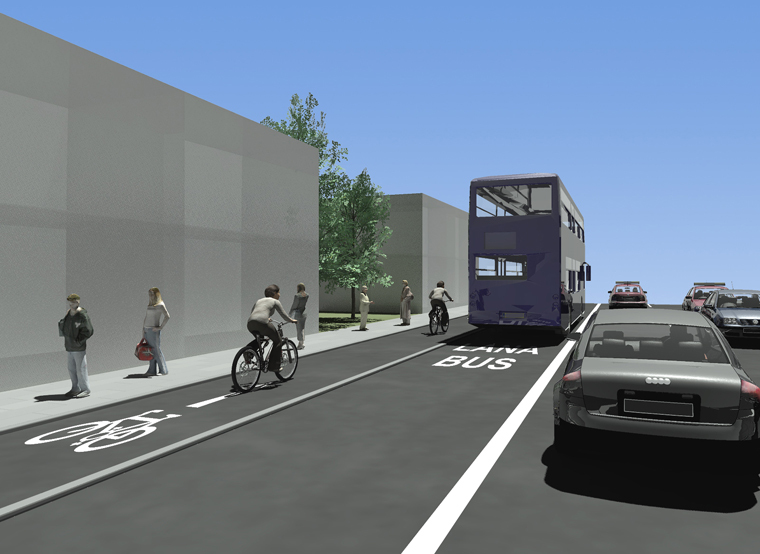 Any surplus bus lane width is hatched off to reduce the bus lane to 3.0m. Cycle Tracks are different from Cycle Lanes in that they are physically segregated from motorised traffic. This is achieved by either a kerb with a level change, bollards etc. They have limited points of access and egress and therefore these locations need to be carefully detailed. 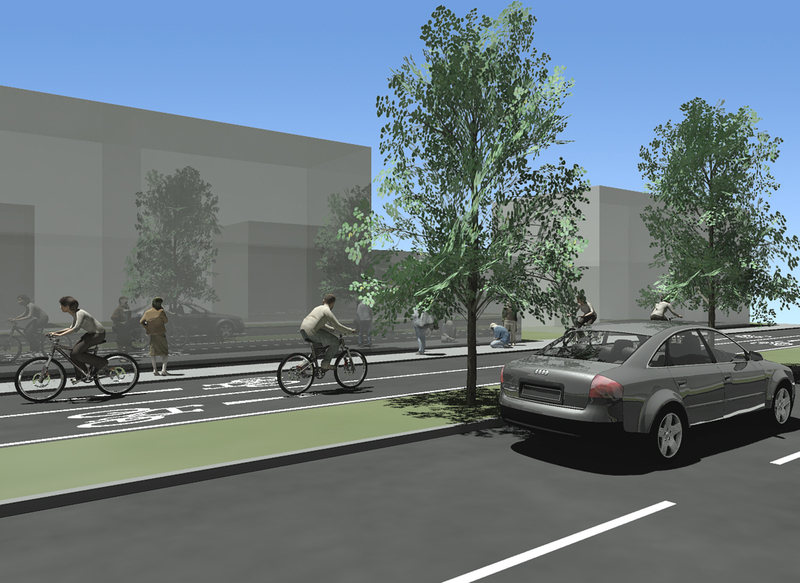 Cycle tracks are generally for situations where the traffic regime is unsuitable for cycling and cannot be otherwise mitigated. 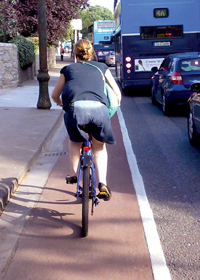 For this reason, it is important that cycle tracks retain their function at all times – otherwise cyclists may be forced into an unsuitable traffic regime. 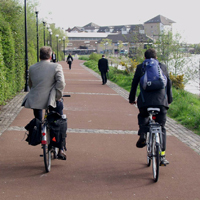 The transitions from cycle track to cycle lane and vice versa are central to the success of cycle tracks. Collector roads, speeds up to 80km/h. 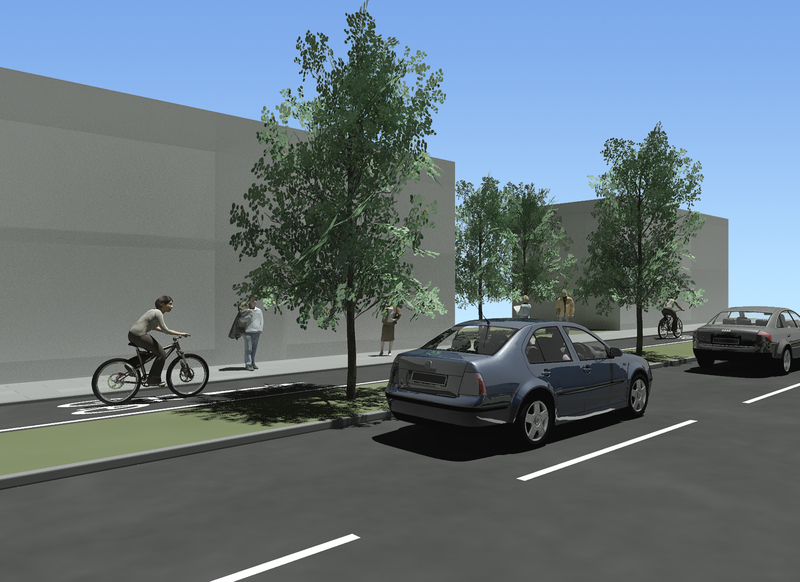 The introduction of contra-flow cycle facilities within an urban one way system can significantly improve in directness and the attraction of cycling. 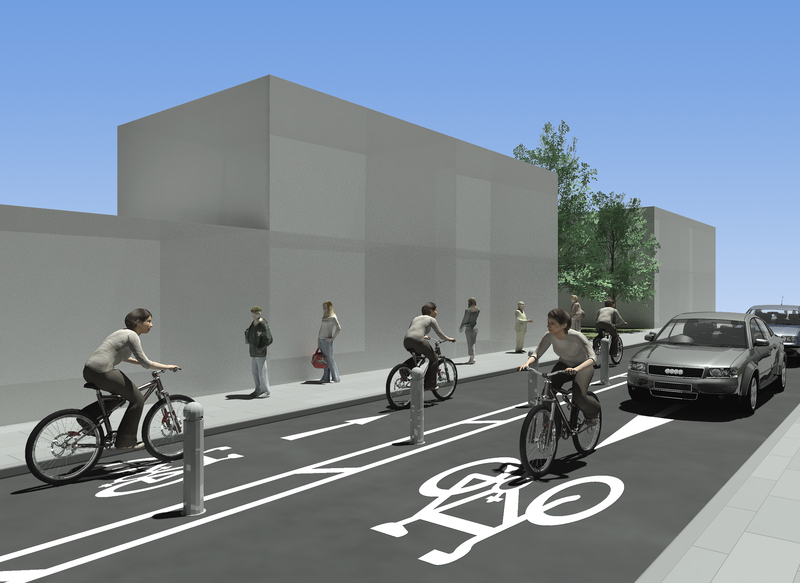 This manual proposes contra-flow cycle lanes and tracks, depending on the volume and speed of the one way traffic.